Do you like coffee? Do you like freebies? Well, we have both for you. SeamlessWeb, a website that lets you order delivery and takeout from 5,000 plus restaurants in 27 cities, is bringing its Free Coffee Days promotion to DC. From February 7th to 27th SeamlessWeb will hand out out more than 75,000 free cups of coffee all over the city from a SeamlessWeb branded truck (Feb. 7-10) and partner restaurants (Feb. 14-27). To coincide with this promotion, SeamlessWeb is giving us two $25 gift cards to give two of our lucky readers. Comment below telling us why you love coffee, and we’ll choose two winners using random.org. 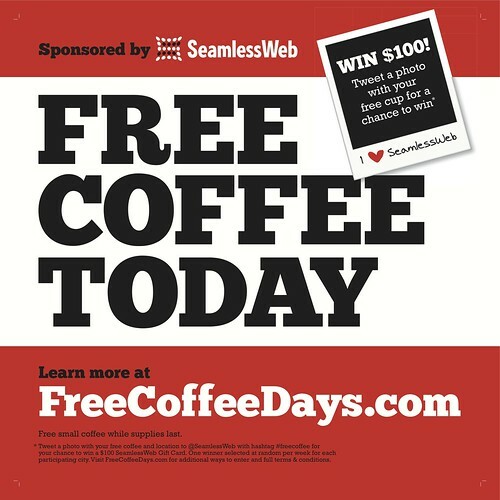 SeamlessWeb is also holding a photo sweepstakes where people can Tweet or post to Facebook a photo of their free coffee to win $100 in food, and offering new customers $5 off an online order by using the code FREECOFFEE ($10 minimum purchase). Enjoy & don’t forget to tell us why you love coffee for your chance to win. We’ll announce our winners on Monday the 14th. I don’t really like the taste of coffee, but I do love how it smells. I love coffee because I’m a junky for its sweet sweet caffeine. I love coffee because it keeps me moving! What is this thing called coffee? 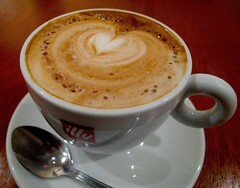 I love coffee because hot drinks make me feel warm and awake in the morning. Also, they seem to soothe my year round allergies. I love coffee because it’s the warm, sympathetic friend that eases the early morning weekday case of the grumpies. Because my boyfriend makes it for me. I love coffee because it’s associated with breaks from work on weekdays and relaxing chats with friends on the weekends – both very happy things! i love it when you pump it full of sugar and flavoring and make it delicious. I love coffee because my ability to stand on the right and walk on the left depends on it. I love coffee because it gives me something to hold and interact with when I need to stall before it’s my turn to talk at work! Two of my favorite things– coffee and food trucks– combined into one?! How can it be? I love coffee because there is no reason to not love coffee. Simple! Coffee is the most magical beverage in that it can warm you up, cool you down, give you a jolt, be blended with delicious treats, and can take the occasional shot of whiskey. It’s a wonder bev!